The first of a self-published series called "The Watson Files." 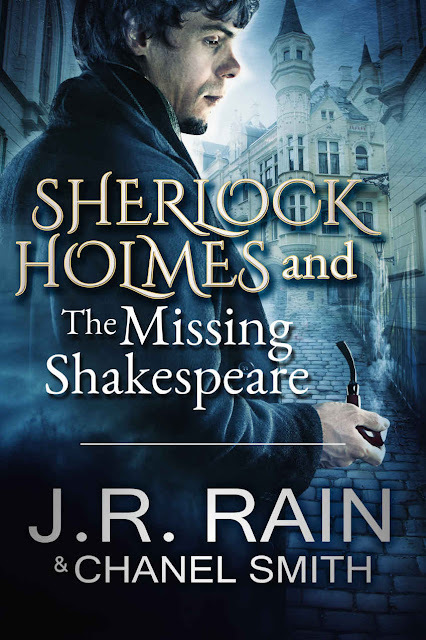 Always fun to see Shakespeare in the mix, but Amazon reviewers seem to agree that there's something "off" about this one (starting with the image of Holmes on the cover). Bestselling author, J.R. Rain, has been delighting fans with his Samantha Moon vampire mysteries for nearly a decade. Now, he sets his sights on the world's most famous detective, Sherlock Holmes! As Sherlock Holmes and his trusted sidekick, Dr. John Watson, begin to unravel the mystery of the missing play, their investigation leads them on a convoluted but logical path. But the closer they come to the missing play, the more their lives are endangered. Now, as the clever pair of investigators become the pursued, can Holmes and Watson locate and recover the missing Shakespeare play without dying at the hands of a diabolical killer?